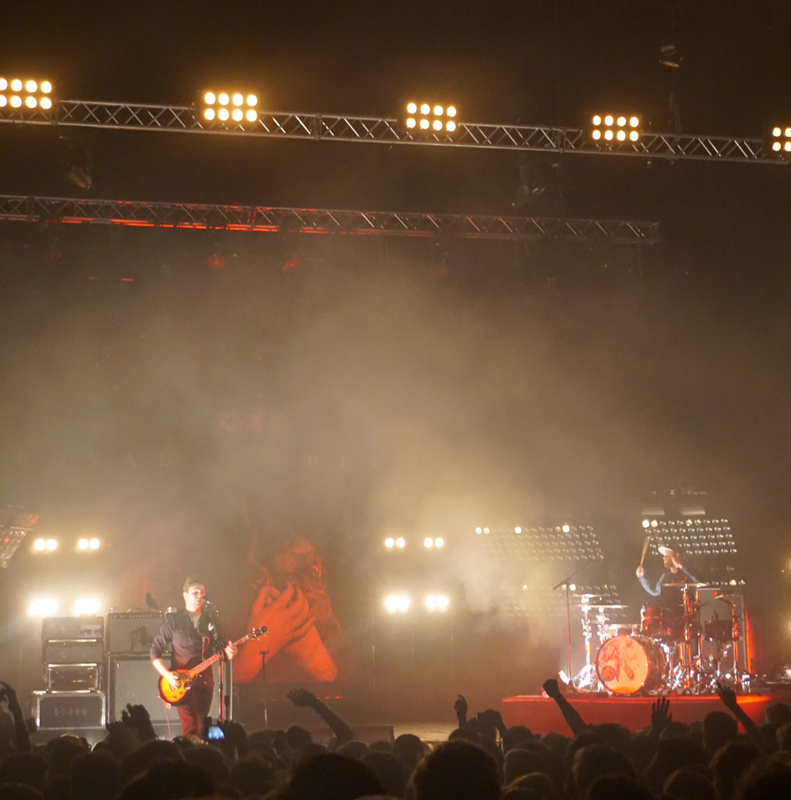 Taking to the stage at the Brixton Academy last night, Royal Blood played their biggest London show to date. Not a band to waste time, they went straight into first track Hole – a B side to Little Monster – which was a courageous song to open with as only hard-core Royal Blood followers would be aware of the track. Despite this, the duo delivered with the raw, confident sound of frontman Mike Kerr’s slick bass guitar and menacing vocals, so it didn’t seem to matter that not everyone in the audience knew the song. The fast paced Little Monster featured halfway through the gig, hyping the audience into a bigger frenzy. The duo didn’t pause for breath, performing hit after hit from their debut album and maintaining the rollicking rock and roll energy that’s made them so popular. It’s amazing that such a vast sound can be produced with just two musicians and instruments, and Royal Blood had the audience enthralled. The sold out show saw firm favourites Ten Tonne Skeleton, Come On Over and Loose Change become sing-along songs, giving the gig a warm and welcoming homecoming vibe. You Can Be So Cruel and Blood Handssaw Kerr’s impressive bass guitar skills come alive and it’s on tracks like these that you can really appreciate Royal Blood’s sheer talent. For a band that only formed in 2013, they’ve come a long way since playing to a room which Kerr states had a “washing machine in”. Seeing Royal Blood only three weeks prior to Brixton at Camden’s KOKO, I knew what to expect from the set list but the show was yet another boisterous triumph for the band.